Thanks for coming by to see my Sweeties card for this week's Cupcake Inspirations challenge. After you've seen all the Sweeties' cards, be sure to run back over and link up your own creation to enter for this week's prize from Stamp Fairy. Do you like this Stamp Fairy Image? I think he is totally adorable. I really wanted him to shine once I colored him - so I just used a simple oval die and scalloped mat from Spellbinders. I colored the seam binding with the same Copic that I used on the image. Adding the button just finished it off I think. I thought the colors were just so yummy! Now run back over to Cupcake Inspirations and link YOUR project to this week's challenge. And I'll see you here next Sunday for another fun challenge card. I thought I would share this over at Freshly Made Sketches also. It fits their challenge sketch this week too! Score!! Now tomorrow I'll be back with a little bitty scrapbook page I did. I hope you'll come back by to see. Those cupcakes sure look scrumptious, as does your card with the colors you used! Love your ribbon treatment and the coloring you did on your image! Thanks for playing along with Freshly Made Sketches! Your card is perfect for the cupcake challenge (and those cupcakes sure look good!) I especially love your ribbon! Thanks for joining us at Freshly Made Sketches this week! 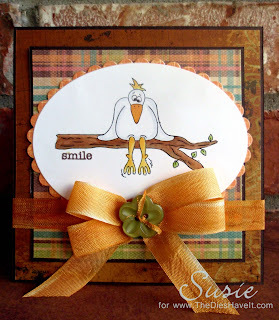 This is adorable Susie, love the warm colours you used and your ribbon treatment is awesome! Thanks for joining us at Freshly Made Sketches! This is wonderful! Great colors - cute cute cute image! And a fabulous bow! He really is adorable! I love how you colored that ribbon...beautiful! So glad you joined us at Freshly Made Sketches this week! Super cute card Susie! I just love that chicken! It made me smile when I saw your card. Wow! Very well done! Great colors and such a cute image. Sweet! Thanks for playing with Freshly Made Sketches this week! Wow .. what a great card Susie ... how cute is that chicken up the tree ... yep, it brought a "smile" to my face ... great job! Hi, your card is very cute. These cupcakes are delicious.